Britain’s far-right is the weakest it has been in 20 years largely due to its own incompetence, a report finds. The findings were published in an annual report by Hope Not Hate, an anti-racism and anti-fascist group backed by the labor movement. The report, titled: “The state of hate in 2014” found cause for concern in the rise of anti-Semitism in the UK. “Against a depressed economy, fear of violent Islamism and rising anti-immigrant rhetoric in the public mainstream, this should be the time to make hay. Instead, the far-right is shrinking, divided and increasingly leaderless,” the report contends. 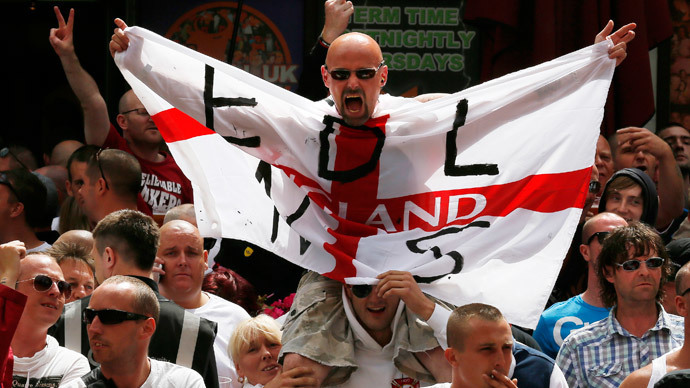 “The British far-right ends 2014 in its worst state for almost 20 years,” it says. Hope Not Hate point to Nick Griffin’s fall from grace in the BNP, the rise of UKIP, and the departure of EDL founder Stephen Lennon – who goes by the alias Tommy Robinson – from the group as causes of the far-right’s weakness. Nick Griffin was given the sack as leader of the BNP after the party lost both its MEPs in the European Elections last year and 56 out of 58 of its local councilors. The drop in support is partly down to the rise of the populist right-wing UKIP, the report argues, which despite not being a far-right party itself, has nonetheless “steamrollered” through their support base. However, the report also places blame on a shift of focus away from the ballot box and towards street activism. Lennon left the EDL in October 2013, claiming the party had become too extreme and he wanted to use democratic ideas instead of violence. However, Hope Not Hate claim that Lennon is currently considering a return to the EDL, as soon as his probation for a mortgage fraud conviction is served this summer. Despite the decline of Britain’s far-right groups, Hope Not Hate expressed concern over the emergence of anti-Semitism in the UK. Jewish Labour MP Luciana Berger received 20 death threats and over 2,000 hate tweets last year, after Garron Helm was convicted for sending anti-Semitic messages to the MP. Good news: support for UK far-right groups at an all time low. Bad news: some of their ideas have gone mainstream. Far-right politics in the UK first emerged in the 1930s. At this time it was made up of Nazi co-thinkers such as Oswald Mosley, who founded the British Union of Fascists (BUF). Banned at the outbreak of war with Germany, the BUF was dissolved in 1940. At the time of its dissolution BUF membership was approaching 20,000. As more and more former colonies were granted independence in the 1950s, the British far-right re-emerged under the banner of empire. The League of Empire Loyalists initially campaigned against granting colonies independence, but later shifted its focus to opposing immigration from the same colonies they once strived to maintain control of. "Support for British Far Right at 20 Year Low" ...but only because their supporters have a mainstream political right wing party to support. As the British far-right became more obsessed with opposing non-white immigration, a number of splinter groups merged to form the original BNP in 1960. The party dissolved within seven years due to internal division, giving way to the rise of a new far-right political force: the National Front (NF). Once the largest far-right political party in the UK, NF membership reached a peak of 17,000 in the mid-1970s. Known for its provocative protests, the NF marched through the mostly non-white area of Lewisham in London in 1977. What ensued was the “The Battle of Lewisham,” a series of clashes between the NF and over 5,000 anti-fascist protesters. Some 214 people were arrested in the clashes and 111 injured. Following the 1979 general election, which saw Margaret Thatcher’s Conservative Party gain control, the NF lost momentum as the British mainstream tilted further to the right. The NF has since split into two feuding factions, according to Hope Not Hate, continuing a common trend among groups that use hatred as political fuel.